Readers - 15 years ago today, Homer Lindsay, Jr. died after a brief battle with cancer. In remembrance of the date of his passing, I am re-posting the article below, posted by yours truly, back in the summer of 2010. Enjoy. Notice since this article posted, Anthony George has left Aloma Baptist Church and now is at FBC Atlanta. A few paragraphs were slightly edited from the original posted article. Anthony George, Pastor of Aloma Baptist Church (Winter Park, Florida) was saved at FBC Jacksonville when he was in high school in Jacksonville in the late 70's or early 80's when FBCJ was pastored by Homer Lindsay, Jr. (picture at left). Well, Anthony George was the speaker at a revival meeting at North Central Baptist Church in Gainesville, Florida June 20-23, 2010. Many of you know that Calvin Carr has been the pastor of North Central since 2007. In one of his sermons at the North Central revival a few weeks ago, Anthony George gave a very moving testimony of the kind of preacher Homer Lindsay was. He spoke of how Homer Lindsay was in stark contrast to what George called the "hip hop" preachers today in the SBC who seem to be going through a mid-life crisis. Lindsay was the opposite of this - a man who was out of style, but still connected to people by teaching them to love Jesus and love people, and through his life showed them that Jesus was real and alive. 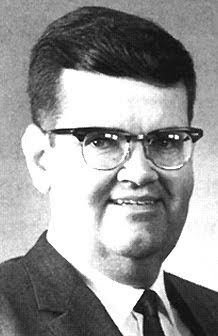 Listen to the five-minute clip below for a true and humorous rememberance of a pastor who was taught to love Jesus by Homer Lindsay and went on to became a fine pastor. Anthony George Remembers Homer Lindsay, Jr. from FBCJax Watchdog on Vimeo. I think Brother Anthony has it right about Lindsay. He was a mega church pastor who didn't seek to be a mega church pastor. Lindsay didn't guilt people into obedience or browbeat people into submission or teach people to be "churchmen". He didn't appeal to people's emotions by trying to be hip or cool, and he didn't have a certain schtick to his preaching that gave him a niche market on the preaching circuit. He wasn't a great story teller or historian, and he didn't have a fantastic, remarkable testimony that made people want to come hear his yarns and tales. He was just a guy who loved Jesus, and loved lost people, and his life's mission was to tell them about Jesus, and to preach the bible in a very plain fashion. In other words: Homer Lindsay was the absolute antithesis of the modern day megachurch pastor. He pastored his flock. He didn't travel to speaking gigs week after week. He didn't go on the SBC preaching circuit. He never sought any glamor or recognition. He never wanted to turn his fame as a mega church pastor into book deals of his latest sermon series - in fact what books he did write were really just copied "booklets" given away for free in the foyer of the church to anyone who wanted them. He viewed Jacksonville as his primary mission field. He did broadcast the entire services live on TV as a means to reach people and serve shut-ins, but he didn't seek to produce 30-minute TV shows of his sermons for broadcast on phony-baloney hair channels like INSP or TBN. When considering the state of the SBC: maybe Lindsay SHOULD have gone on the preaching circuit just a bit, and maybe he should have gone to the seminaries to speak to the next generation of pastors more frequently. Then maybe the SBC wouldn't be in the mess it is these days if more pastors were emulating his example, instead of acting like rock-star, jet-setting celebrities out to make a buck and build their own family brand name. And maybe we would have less of the mega church wannabe pastors who empower these celebrities by defending their sins and excesses and licking their boots every chance they get. Thank God there STILL are some SBC preachers more like Lindsay, some even at larger churches. It's just that we don't hear much about them - they aren't in power at the SBC and they're not on the preaching circuit - they are busy pastoring their flocks. Dr. Lindsay's shoes were just too big to fill. He was an obedient servant and loved God, family, and church. It's a real shame a lot of those that heard him did not follow his example which would have made a big difference in todays world. I loved to hear Dr. Lindsay preach. He was old school. I love how he pleaded for souls to be saved. Relating to earlier topic--CB Scott reinstated.